Just in case you were wondering how come the galaxy’s elite fighting force in the Star Wars universe, the Stormtroopers, are unable to actually land a single shot against a rag tag group of rebels, something must be very wrong somewhere. Perhaps there is a flaw in the original clone that made up the early Stormtroopers, or the later military training provided were simply inadequate. Either that, or the Stormtroopers themselves simply do not have the kind of mental aptitude to carry out their duties in an effective manner. 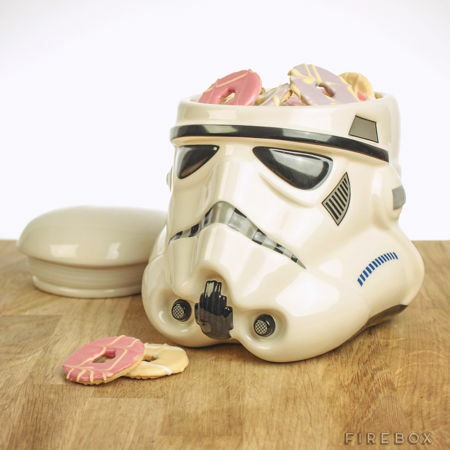 The £34.99 Stormtrooper Cookie Jar would explain a whole lot, don’t you think so? Open it up, and where the brains are supposed to be, lie your favorite bunch of cookies, now how about that?